Finland has some of the best tap water in the world. Even though we are blessed with plentiful supplies, it should still be used sensibly. Reducing your water consumption and water bills is this simple: simply change your old aerators for modern constant flow aerators – that’s all! 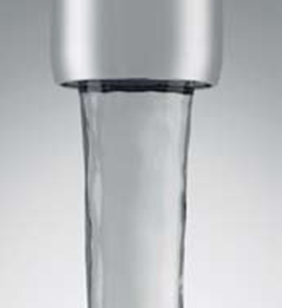 Your water consumption per tap will decrease by at least 15 percent and up to 80 percent. 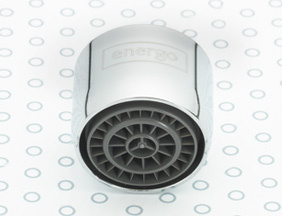 Energo’s water saving solutions are based on our constant flow aerator technology, which limits water consumption and automatically maintains the flow at the desired level even if the pressure in the water mains radically increases or decreases. 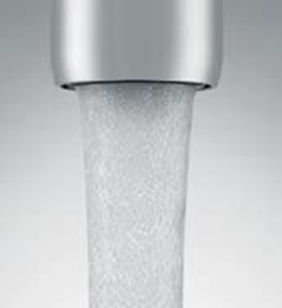 We also make sure that our constant flow aerators work perfectly with the water system. Our constant flow aerators also enhance the user experience by preventing water from splashing everywhere, which often happens with old taps if you turn them on too much. With constant flow aerators the water flow is pleasantly soft and steady, and the oxygenated water also flows more quietly. The carbon footprint of replacing your aerators is very small, as the taps themselves do not need to be changed and no work is required on the water pipes either. We send all your old aerators to be recycled. All Energo aerators have in common an advanced design, test-proven flow properties, sustainable materials, precision dimensions, optimal performance and a long lifespan. 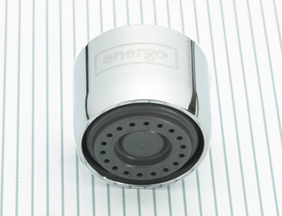 Energo aerators cannot become clogged due to impurities in the water. 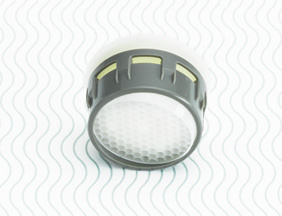 Lime, chlorine, humus and rust do not stick to the filter inside the aerator, which also prevents slime from building up. 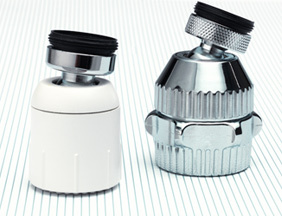 Our aerators can also withstand soft water, which can dissolve poor-quality aerators. Prevents bacteria and microbes in the air from mixing with the water. Our basic aerators provide an aerated, straight, round and splashless stream, providing a standard solution for bathrooms and kitchens. The maximum flow from the tap remains steady even if the pressure in the water system changes. Several flow options: 1.7-8.2 l/min. Our laminar aerators provide a bacteria-free stream, providing an ideal solution for hospitals and other spaces that require clean technology. This solution prevents bacteria and microbes in the air from mixing with the water. The maximum flow remains steady. Available also without constant flow technology. Several flow options: 5-8 l/min. 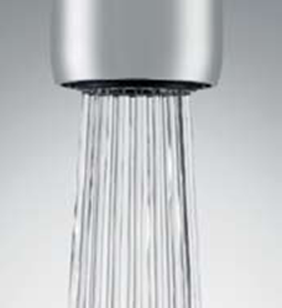 Our spray aerators provide a shower-like stream, providing a mini-shower for sinks in public spaces. The spray area is the width of a palm. This solution improves the flow in low-pressure water systems. The maximum flow from the tap remains steady even if the pressure in the water system changes. Several flow options: 1.0-8.0 l/min. Our silicon aerators aerate the water and provide a solution for water systems that contain high levels of rust or humus. Silicon aerators repel impurities, and deposits are easy to wipe off. The maximum flow remains steady. Several flow options: 3.7-8 l/min. The articulated aerator improves productivity in kitchens and prevents splashing, also in bathrooms. The stream can be directed where it is needed. 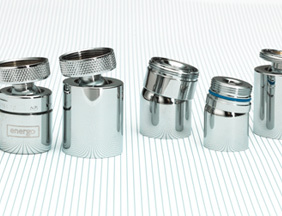 Several flow options: 3.7-12 l/min. Our dual function articulated aerators provide both a spray and normal stream. Several flow options: 6-12 l/min. Available in white or chrome. Our directional aerators allow you to turn the stream by up to 45 degrees in the desired direction. Our product range also includes numerous other advanced alternatives. Let us know what your needs are during the planning stages, and we will find the optimal solution for you. We provide a solution to prevent vandalism and theft in public toilets with aerators that can only be removed using a special tool. 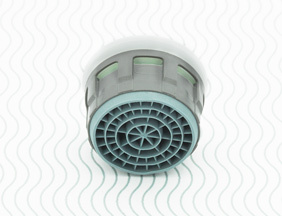 Ecobooster dual function aerators allow you to switch between high and low pressure with the press of a button. 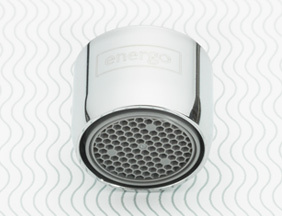 Our self-cleaning aerators automatically clean themselves when the tap is turned on. Heavy duty version also available. Finland has some of the best tap water in the world. 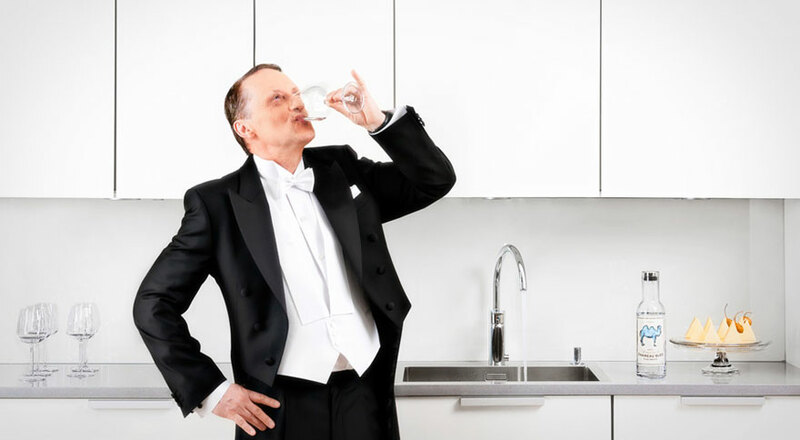 For example, the quality of the tap water in Helsinki has been proven to be higher than that of expensive branded imported bottled water. 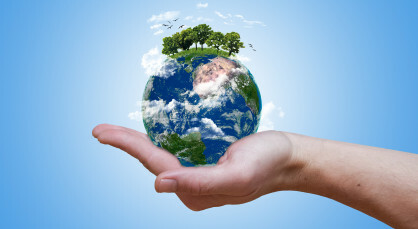 Even though we are blessed with plentiful supplies of natural water resources, they should still be used sensibly. Pure water is increasingly scarce in the world, so let’s use our fine water resources respectfully and in moderation while taking into consideration the needs of future generations.